Students are expected to be familiar with the general requirements stated in the Bulletin of the Columbian College of Arts and Sciences. Among other requirements, Human Paleobiology PhD requirements include a minimum of 72 credit hours, including at least 6 and at most 24 hours of Dissertation Research (HOMP 8999). A minimum of 48 of the 72 credits must be taken in precandidacy stage. In the PhD program, these 48 credits include the following: core and elective course work, two laboratory internships, a Public Understanding of Science internship, and other training experiences outlined below. To see a full course listing please view the Courses page. *This requirement can be fulfilled by any number of different courses, chosen in consultation with the advisor. Depending on their intended field of specialization and background, students will also take courses from a wide variety of electives. The electives are to be determined by the student in consultation with his/her advisors. Elective courses are intentionally meant to allow for flexibility, and we encourage students to formulate a unique curriculum that is tailored to best serve their interests. In Year 1, students will take a seminar that will focus on the ethical dilemmas faced by all scientists, as well as on those specific to human evolutionary studies. This module will also cover critical reading and reviewing skills, time and project management, building and managing a team, manuscript and grant writing, oral and visual presentation skills, interview protocols, laboratory safety and preparation of research plans and curriculum vitae. This seminar has the goal of equipping graduate students with the skills and attitudes needed to operate in a collegial system that allows for sharing data and ideas while protecting the rights of individual scientists and organizations. At the outset of their training, students are expected to attend at least one professional meeting per year, present their research at professional meetings, and publish articles in peer-reviewed journals. The faculty works closely with students on their first presentations and publications. During their second and third years, students participate in laboratory internships of semester-long involvement in fields that complement their research interests and/or allow them to build important transferrable skills. Students register for 3 credit hours for each rotation. The student’s work schedule is negotiated directly with the rotation supervisor. Laboratory rotations are to be determined by the student in consultation with his/her advisors, and will be available at laboratories both within and outside of GW. Students are encouraged to pursue laboratory rotations at GW or any institution which best serve their interests. The responsibilities of scientists who study our species’ evolutionary history must also extend to the public at large. 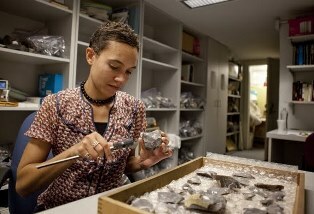 Therefore, an important component of the Human Paleobiology graduate training program is an internship in the “Public Understanding of Science.” Before the end of Year 5, students undertake a part-time, semester-long or summer internship with an organization that presents science to the public. To date, students have successfully completed internships working directly on articles and website material at the National Geographic and USA Today, working with producers at NPR and contributing their own pieces, contributing to public initiatives on the understanding of race and human variation with the American Association of Anthropologists and AAAS programs on science, ethics and religion, and helping to design the content of a major Human Origins Hall at the Smithsonian’s National Museum of Natural History. Other standing opportunities include attachments to the exhibits or education departments, or the public outreach, public relations, or congressional affairs offices of the Smithsonian Institution (e.g. The National Zoological Park, The National Museum of Natural History), or to other appropriate organizations based in Washington, DC (e.g., The National Geographic Society, National Public Radio, The Washington Post, Science Magazine, The National Academy of Sciences). Students also assist faculty and senior students participating in 'The Scientist is In' discussions in the Smithsonian's Hall of Human Origins at least once during their first two years in the program. They then lead such discussions, or participate in other forms of outreach, in Years 3-5. These weekly program meetings bring together students, faculty, and other researchers in our Center to participate in interdisciplinary discussions of the most recent published research in our field. Students of all stages in the program are encouraged to lead Journal Club discussions as they choose. During the post-Candidacy stage, students are required to lead these discussions once annually. Students generally begin research for the dissertation (including preparation of a dissertation proposal) after completing their first qualifying exam at the end of Year 2. The final steps before being advanced to Candidacy include successful completion of a second qualifying exam in their chosen research area, and a Dissertation Proposal Defense. The Dissertation Proposal Defense comprises a written proposal in the form of a National Science Foundation Doctoral Dissertation Improvement Grant, an oral presentation, and a defense of the student’s proposed dissertation topic. The Dissertation Proposal Defense is completed by the end of Year 3. For Human Paleobiology students, the dissertation committee includes a Director or Co-Director who is a core CASHP faculty member from GW, and additional advisors that are drawn from CASHP or elsewhere, with at least one reader from outside GW. Other components of the Human Paleobiology PhD program include regional training workshops for interested students, and teaching experience for professional skills development, and training in international settings. Students are also strongly encouraged to undertake at least one component of their graduate training outside of the United States.